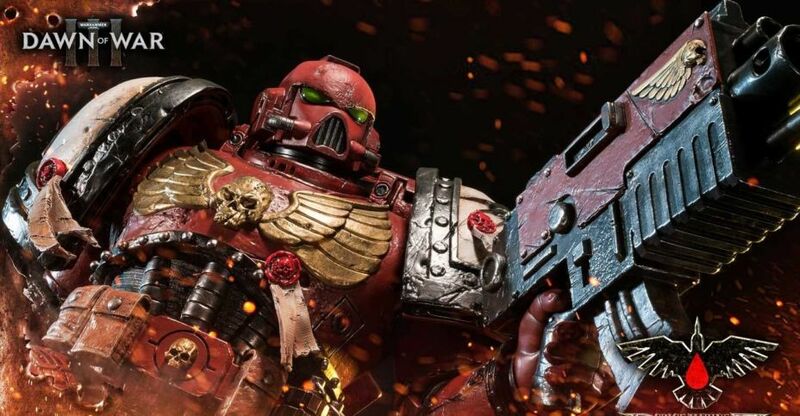 Prime 1 Studio has opened Warhammer 40,000: Dawn of War III – Space Marine Blood Ravens Statue. There will be a Standard Version as well as a Deluxe Version. This massive 1/4 scale statue will stand over 28″ tall. It will include multiple swap out arms, each holding different weapons. The Deluxe version includes a swappable unmasked portrait and hand wielding a Power Axe. It’s due for release some time between August 2019 and October 2019. Pre-order at the links below and click the headline of the story for the photos. Prime 1 Studio & Games Workshop are proud to present 1/4 Scale PMWH40K-02DX: Space Marine Blood Ravens Deluxe Version from Warhammer 40,000: Dawn of War III.